With its 50 cm width, this RAW wall sconce is made to fit a more modern and industrial environment. It is flat and only the edges have a depth. A real eye catcher. This size is also the limits of what can be hammered by hands in my workshop. It is handmade in brass and later been tinned. As the pewter (tin) is soft and sensitive to heat, the base, made of brass, will stand for safety if you forget to blow the candle out. This product you do not need to polish. Just wash it with lukewarm water if needed. 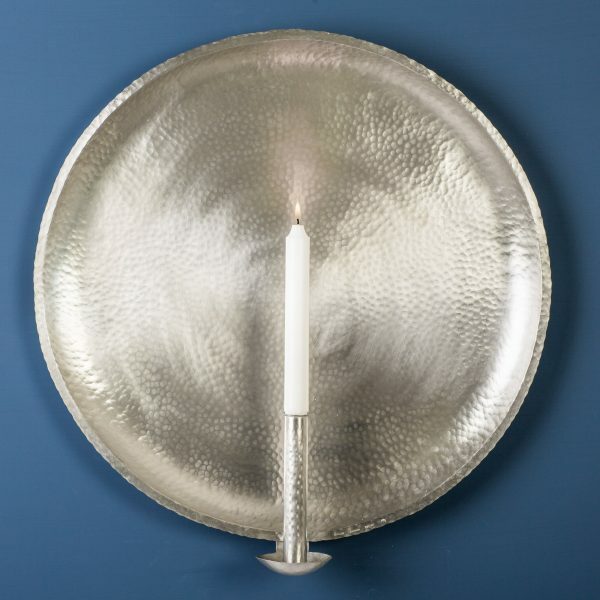 Use a standard candle for this wall sconce.